Men’s Club Champions for 2016: Eric Kidd (B Grade), Peter Gibson (A Grade) and Sam Cockburn (C Grade). Julie Newsham achieved the difficult task of a Hole-in-One on the 11th hole. By doing so she won a $500 prize from our sponsor A&J Auto Body Repairs of George’s Rd Salamander. On the same day, Life Member Joan Frost (who admits to being over 80) scored an incredible 43 points. 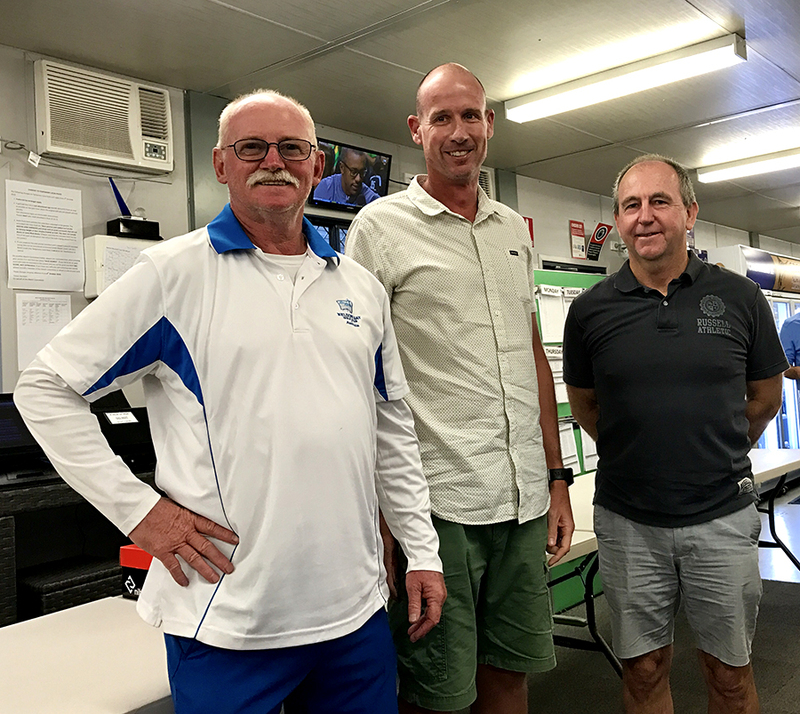 Sunday 15 January was the club’s Opening Day which signals the commencement of the 2017 competition program. A large field participated, with the winning team being Paul Kennedy, Simonne Irvine, Ian Edmunds and Tony Short. Club President Max Pride, in his welcoming address, reminded members that it will be only five months until the new clubhouse is completed. There will be plenty of work by all concerned between now and then. There were also the Presentations for the Men’s and Mixed events conducted in 2016. Sunday 15 January: Opening Day teams, best two scores to count. Winners: P Kennedy, S Irvine, I Edmunds, T Short. 97 pts. Monday 16 January: Vets 9 holes: J. Stuhmcke 23 pts, R. Cornege 22. Tuesday 17 January: Ladies Stableford. Div 1: R. Uptin 37, H. Atkins 36; Div 2: J. Frost 43, A. Hellmrich 40; Div 3: A. Poulos 37, P. Norman 36. Wednesday 18 January: Men’s Stableford. Course 1: A Grade: G. Wardle 41, W. Dart 36; B Grade: L. Hora 43 (cb) M. Selmo 43; C Grade: R. Brighton 42, P. Griffin 38. Course 2: A Grade: J. Gascoigne 43, P. Metham 40; B Grade: I Warrington 40, L. Hair 39; C Grade: Don Jones 37, P. Dee 35. Thursday 19 January: Ladies Div 1: R. Shaw 38 (cb), R. Kennet 38; Div 2: E. Lloyd 36 (cb), P. Cleare 36; Mens Vets: F. Mahoney 20, T. Curtayne 19. Friday 20 January: Ladies Div 1: F. Giudes 38; Div 2: C. Fishburn 40; Men A Grade: R. O’Shannessy 43, G Wardle 41; B Grade: D. Middlebrook 44, N, George 42; C Grade: R. Ball 47, P. Page 43. Grade: I Woodhill 40, J. Timbs 39; Ladies: R. Hemberg 38, J. Tolhurst 37.